Free jazz is little more than an afterthought in the consciousness of the jazz world today, so it is refreshing as well as a bit intriguing to see a gutsy new release in this genre, from a major label nonetheless. Guitarist and Phish front-man Trey Anastasio has admirably used his stature in the music industry to get an album released which otherwise probably would have entertained a small record label and an even smaller audience. Whether or not this bit of trickery was appreciated by the legions of Phish fans who had their ears unwittingly opened up to the radically different sound of this album is somewhat beside the point. Surrender to the Air is a wonderful collaborative effort, featuring an impressive and adventuresome lineup of musicians and deserving of a much wider audience than it is likely pigeonholed into. Conceived as an unabashed tribute to Sun Ra, Surrender to the Air gave Anastasio a chance to gather ten of his musical idols and set them free in an environment completely devoid of stylistic frameworks or restrictions. The cast is worth noting: Sun Ra veterans Michael Ray on trumpet and Marshall Allen on alto sax, keyboardist John Medeski, guitarist Marc Ribot, trombonist James Harvey, vibraphonist Damon Choice, drummers Bob Gullotti and Jon Fishman, and the brothers Burbridge — Kofi on flute and Oteil on bass. The music is arranged into two long movements; arising out of nothingness, each embodies an abstract exploration of the aural possibilities presented by various groupings of these musicians before descending back into silence. The moods fluctuate from chaotic and densely atonal to somber and delicately mysterious. Contrary to what one might suspect, the guitars are most inconspicuous within this lush instrumental collage. In fact, the very thing that makes this project work so well is the fact that eleven premiere musicians, so accustomed to their own spotlight, managed to leave their egos completely at the door. There is no soloing in the traditional sense, no adherence to the standard roles and rules which define most improvised music. The music swells and retreats like the tides; individual instruments fade as others flow to the foreground in an organic and perpetual cycle of tonal color and textural nuance. An almost utopian equality unites the players into a conceptual whole — the CD bears only a title for the music, while the ensemble remains nameless and the performers are merely listed in small-print. 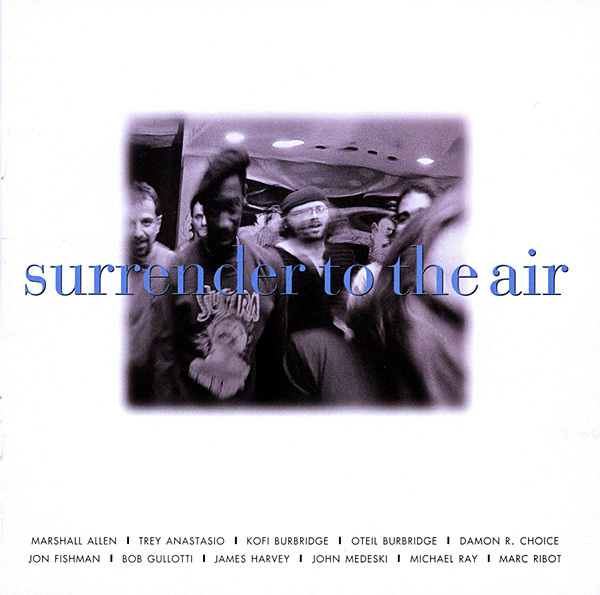 Surrender to the Air has an underlying elegance that few other albums in the genre approach, and it is certainly one of the best exponents of the free jazz spirit to come along in many, many years. It may take more than a few listens to reveal its ample delights, but this album will duly reward the adventurous listener.